Although most geometric modelers are designed as being unitless, a CAD document usually interprets the data as having a specific model length unit that specifies the meaning of the dimensions of the geometric objects within that container. In other words, it is the document that dictates the actual lengths being represented by the unitless values used by the modeler. This value is, in turn, used to interpret the tolerances of the model. 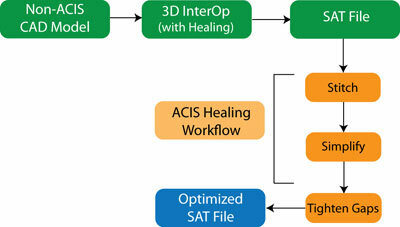 The healing functions within 3D InterOp comprehend these differences and properly interprets the meaning of unit during model translation and healing. the specified tolerance, which has at least one short edge and, at most, three long edges. First, any short edges detected in the given entity are replaced with tolerant vertices. Then sliver faces are replaced by tolerant edges. The resulting tolerant edges are then considered for merging, with any remaining tolerant edges returned to the list of sliver faces to be worked. created in one system may not be considered valid when imported into another kernel. In addition, the geometrical or topological errors might occur during the translation process due to differing interpretations of the data. To ensure precise and valid translation, 3D InterOp provides this option for repairing and healing the translated files. Repairing involves checking the translated file for corrupted data and fixing the invalid data. During translation, 3D InterOp’s healing corrects the differences in precision of source and target entities. Modification of the geometry which involves reconstruction of self-intersecting and irregular curve geometry of edges, co-edges, and surface geometry of faces, as well as the trimming 6 and sub-setting of underlying surfaces of faces to conform to the rules of the target modeling kernel. 3D InterOp healing does not modify the geometry, ensuring that output conforms to the shape of the original. The goal of the automatic healing with 3D InterOp is to create a model with sufficient quality to be correctly interpreted by the target modeling kernel while retaining the fidelity of geometric shapes in that data so they are as close as possible to the designer’s original intent.